St. Thérèse of Lisieux cherished a special devotion to the Holy Angels. How well this fits her Little Way, for did not our Lord associate littleness with the presence and care of the Holy Angels: "See that you do not despise one of these little ones; for I tell you, their Angels in heaven always behold the face of My Father in Heaven" (Matt. 18:10). When we look to see what the Little Flower says about the holy Angels, we do not expect a ponderous treatise, but rather a medley of songs issuing from her heart. From her childhood they formed a part of her experience and spiritual environment. As a child of nine years, before her First Holy Communion, St. Thérèse consecrated herself to the holy Angels as a member of the "Association of the Holy Angels" with the words: "I solemnly consecrate myself to your service. I promise, in the presence of God, of the Blessed Virgin Mary and my companions, to be faithful to you and to apply myself to imitate your virtues, principally your fervor, your humility, your obedience and your purity." Already as an aspirant she had promised: "to honor with a special devotion the holy Angels and Mary, their august Queen. … I will work with all my strength to correct my faults and acquire virtues, to fulfill all my duties as a student and as a Christian." The members of the Association also fostered a particular devotion to the Guardian Angel, to whom they prayed: "Angel of God, heavenly prince, vigilant guardian, faithful guide, charitable shepherd, I rejoice that God created you with so many perfections, that He sanctified you through His grace and that He has crowned you with glory for having persevered in His service. May God be praised for all the many good things He has done for you! May you yourself be blessed for all the good you do for me and my associates! I surrender to you my body, my soul, my memory, my intelligence, my imagination and my will. Govern me, enlighten me, purify me and dispose of me according to your good pleasure" (Manuel de l’Association des Saints Anges, Tournai). The mere fact alone that the future Doctor of the Church made this consecration and said these prayers as a child does not, of course, make it part of her mature spiritual doctrine. However, in her maturity, she not only recalls these consecrations with joyful approbation but commends herself to the Angels in different forms--as we shall see. This witnesses to the importance she attached to this bond with the holy Angels. In "The Story of a Soul," she writes: "Almost immediately after my entrance at the Abbey, I was received into the Association of the Holy Angels. I loved the pious practices it imposed, as I had a very special attraction to pray to the blessed spirits of heaven, particularly to the one whom God gave as the companion of my exile" (Story, ch. IV, 40). The Guardian Angel: The Little Flower grew up in a family on familiar terms with the Angels. Her parents spoke spontaneously of them in varied circumstances (cf. Story I, 5ro; Letters = LT 120). And Pauline, her older sister, assured her daily that the Angels were there to watch over and protect her (cf. Story, II, 18vo). In her play, The Flight into Egypt, St. Therese describes important aspects of the mission of the Guardian Angel. There the Blessed Virgin tells Susanna, the wife of a brigand and the mother of the infant Dismas, sick with leprosy: "Ever since his birth, Dimas has always been accompanied by a heavenly messenger and this messenger will never leave him. Just as he does, you, too, have an Angel charged to guard you night and day. It is he who inspires the good thoughts and virtuous actions that you accomplish." Susanna responds, "I assure you that no one other than yourself has ever inspired me with good thoughts and that I have not yet seen the messenger you speak of." Mary replies: "You have not seen him, I know that, because the Angel who stands at your side is invisible; nonetheless he is as truly present as I am. It is thanks to his heavenly inspirations that you have felt the desire to know God and to see Him draw near to you. All the days of your earthly exile these things will remain mysteries for you, but when the time comes, you will see the Son of God descending upon the clouds of heaven, accompanied by all His legions of Angels" (Act I, Scene 5). In this way Thérèse gives us to understand that Dismas’ Angel accompanied him through all the thick and thin of his criminal life and finally helped him recognize Christ’s divinity on the Cross and awakened his longing for God, thus helping him to steal heaven and become the Good Thief. In real life, the Little Flower encouraged her sister Céline to live holy abandon by appealing to the presence of her Guardian Angel: "Jesus has placed near you an Angel from Heaven who is always looking after you; he carries you in his hands lest your foot strike against a stone. You do not see him, and yet he is the one who for twenty-five years has preserved your soul, who has kept its virginal whiteness; he is the one who removes from you the occasions of sin. 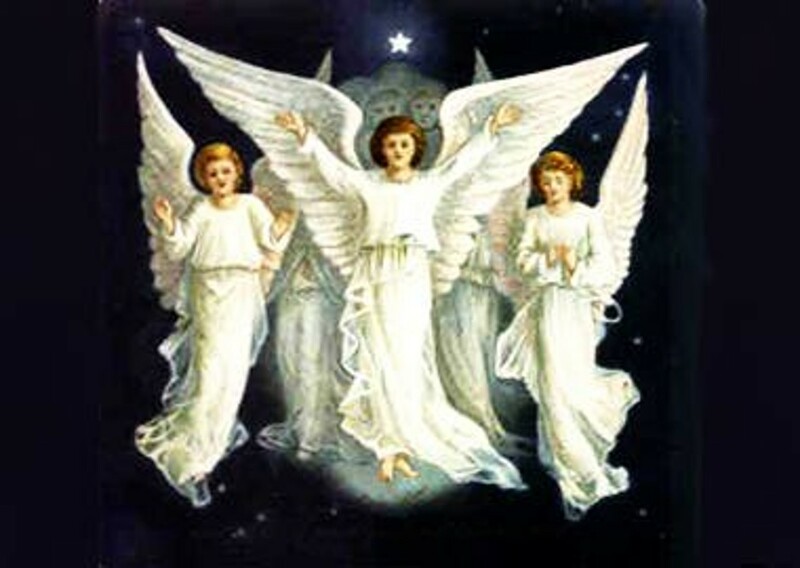 ...Your Guardian Angel is covering you with his wings, and Jesus, the purity of virgins, reposes in your heart. You do not see your treasures; Jesus is sleeping and the Angel remains in his mysterious silence. However, they are there with Mary who is hiding you also under her veil!…" (LT 161 4/26/1894). On a personal plane, she sought guidance from her Guardian Angel: "My holy Guardian Angel, cover me with your wing. / With your fire light the road that I’m taking. / Come, direct my steps… help me, I call upon you / Just for today." (Poems = PN 5, 12). Confident in her intimate friendship with her Angel, Thérèse did not hesitate to ask specific favors of him. For example, to her uncle mourning the death of a friend she wrote: "I place myself in my good Angel’s hands; I think that a messenger from heaven will carry out my message well. I’m sending him to my dear Uncle to pour some consolation into his heart insofar as our soul can contain it in this valley of exile…." (LT 59 8/22/1888). In a similar way she could send her Angel to participate in the Mass that her spiritual brother, Fr. Roulland, a missionary in China, would be offering for her: "On December 25 I will not fail to send my Angel so that he may place my intentions near the host that will be consecrated by you." (LT 201 9/1/1896). This mediation of our prayers is articulated more formally in her play, "The Mission of Joan of Arc". In it, Sts. Catherine and Marguerite tell Joan: "Lovely child, our sweet companion, your voice so pure has ascended to Heaven. The Guardian Angel who always accompanies you has presented your wishes to the Eternal Godhead." (Scene 5). Had not St. Raphael assured Tobit: "When you prayed,... I offered your prayer to the Lord!" (Tob 12,12)? From God the Angel brings light and grace, in a word, a blessing. Thus, St. Marguerite assures Joan, "With Michael, the great Archangel, we will return to bless you" (The Mission of Joan of Arc, Scene 8). This blessing will be a source of strength and perseverance. St. Michael explains to Joan: "You have to fight before you can claim victory!" (Scene 10). And combat Joan did, drawing her courage from her faith in God in all humility. When the hour of her death arrived, though, Joan was initially revolted at being betrayed. But St. Gabriel came and showed her that by suffering death through betrayal she would be more closely associated to Christ who also was betrayed. Joan responds: "O beautiful Angel! Your voice is sweet! I feel hope being reborn in my heart when you speak to me of the sufferings of Jesus…" (The Combat and Victory of Joan of Arc, Scene 5). Similar thoughts must have sustained Thérèse of the Face of Jesus in her bitter trials at the end of her life. Uniting with the Angels: Thérèse sought neither visions nor consolations: "You will remember that it’s ‘my little way’ not to desire to see anything. You know well that I’ve said so often to God, to the Angels, and to the saints: my desire is not see them here on earth…" (Yellow Notebook of Mother Agnes = CJ, 6/4/1897). "…I’ve never wanted any visions. We can’t see here on earth, heaven, the Angels, etc., just as they are. I prefer to wait until after my death" (ibid, 8/5/1897). Rather she sought their efficacious help towards holiness. In her parable on the little bird, she cries out to Christ, "O Jesus, Your little bird is happy to be weak and little… it doesn’t feel desolate; it’s little heart is at peace and it begins once again its work of love. It calls upon the Angels and Saints who rise like eagles before the consuming Fire, and since this is the object of the little bird’s desire, the eagles take pity on it, protecting and defending it, and putting to flight at the same time the vultures who want to devour it." (Story, IX, 5ro-5vo). With respect to Holy Communion she thought it not odd to be often without consolation. "I can’t say that I frequently receive consolations when making my thanksgivings after Mass; perhaps it is the time when I receive the least. However, I find this very understandable since I have offered myself to Jesus not as one desirous of her own consolation in His visit but simply to please Him who is giving Himself to me." How did she prepare for our Lord’s coming? She continues: "I picture my soul as a piece of land and I beg the Blessed Virgin to remove from it any rubbish that would prevent it from being free; then I ask her to set up a huge tent worthy of Heaven, adorning it with her own jewelry; finally, I invite all the Angels and Saints to come and conduct a magnificent concert there. It seems to me that when Jesus descends into my heart He is content to find Himself so well received and I, too" (Story, VIII, 79vo-80ro). The Angels too delight in this banquet which makes us "their brother," as Thérèse, in the play, has St. Cecilia explain to her converted spouse, Valerian: "You must go sit at the Banquet of Life / To receive Jesus, the Bread of Heaven. / Then the Seraphim will call you his brother, / and seeing in your heart the throne of his God, / he will have you leave earth’s shores. / You will see the dwelling of this spirit of fire" (PN 3 St Cecilia, ll.67-72). Still, the mere help of the Angels alone wasn’t enough for the Little Flower; she wanted their friendship and an intimate share in the intensity of their love for God, indeed, she desired that they adopt her as their own. Hence, her audacious prayer: "O Jesus, I know it, love is repaid by love alone, and so I searched and I found the way to solace my heart by giving you Love for Love…. Remembering the prayer of Elisha to his Father Elijah when he dared to ask him for his double spirit, I presented myself before the Angels and saints and I said to them: ‘I am the smallest of creatures; I know my misery and my feebleness, but I know also how much noble and generous hearts love to do good. I beg you then, O blessed inhabitants in heaven, I beg you to adopt me as your child. To you alone will be the glory which you will make me merit, but deign to answer my prayer. It is bold, I know; however, I dare to ask you to obtain for me your double love’" (Story, Ms B. 4ro). True to the Litte Way, Thérèse sought not glory, but only love: "The heart of a child does not seek riches and glory [even the glory of heaven]. She understands that this glory belongs by right to her brothers, the Angels and Saints. Her own glory will be the reflected glory which shines on her Mother’s [the Church] forehead. What this child asks for is Love. She knows only one thing: to love You, O Jesus." (ibid.). But once she gets to Heaven, she would behold God to her heart’s content. To the suggestion she would be ranked among the Seraphim, she responded, rather tongue in cheek, "Ah! But if I go among the Seraphim, I shall not do as they do! All of them cover themselves with their wings before God; I will be very careful not to cover myself with my wings" (CJ, 9/24/1897). Thérèse, beyond availing herself of the Angels’ intercession and willing assistance, went so far as to claim their holiness, so as to grow in the same herself. In her Oblation to Divine Mercy, she prays: "I offer you all the merits of the Saints (in Heaven and on earth), their acts of Love and those of the holy Angels. Finally, I offer You, O Blessed Trinity, the love and merits of the Blessed Virgin my dear Mother. It is to her I abandon my offering, begging her to present it to you." (Pri 6). She similarly implored her Guardian Angel: "O Fair Angel of the Fatherland, / give me your holy fervor. / I have nothing but my sacrifices / and my austere poverty / With your celestial delights, / offer them to the Trinity. (PN 46, 4 To My Guardian Angel). In her own religious consecration to God Thérèse also felt a deep union with the holy Angels. "Chastity makes me the sister of Angels, / of those pure, victorious Spirits." (PN 48, 3 My Weapons). She encouraged her novice, Sr. Mary of the Trinity, with the verses: "Lord, if You cherish the purity of the Angel, / Of that spirit of fire which swims the azure skies, / Do You not also love, rising above the mire, / the lily that Your love knew how to keep pure? / My God, if the Angel with vermilion wings / Who appears before You is happy, / My joy even here below is like his, / Since I have the treasure of virginity!…" (PN 53, 4 For Sr. M. of the Trinity). On their part, the Angels’ esteem for the consecrated souls focuses more upon the special spousal relationship souls enjoy with Christ (and in which every soul can share): "Today the Angels envy you. / They would like to enjoy the happiness / That you possess, O Marie! / As the Lord’s spouse. (PN 10, 9 Shepherdess Queen; cf. PN 43, 12. Profession of Sr. M. Madeleine). Suffering and the Angels: The Little Flower was acutely aware of the profound difference separating Angels and men. One might have thought she would envy them. Quite the contrary, she understood the Incarnation too well: "When I see the Eternal God wrapped in swaddling clothes, / when I hear the poor cry of the Divine Word, / O my dearest Mother, I no longer envy the Angels, / for their Powerful Lord is my dearest Brother!…" (PN 54, 10 Why I Love You, O Mary!). So do the Angels, and so--if it were possible--they would envy us poor creatures of flesh. In a Christmas play, where she names the Angels according as their task is related to Christ (e.g., Angel of the Infant Jesus, Angel of the Holy Face, Angel of the Eucharist), she has the Angel of the Final Judgment sing, "Before You, sweet Child, the Cherubim bows low / lost in admiration, he ponders Your ineffable love. / As You, he would like, upon the somber hill, / to be able to die one day!" Then, all the Angels sing in refrain: "How great is the happiness of the humble creature / the Seraphim, enraptured, would abandon / O Jesus, their angelic nature / and become infants!" (Angels at the Crib, Final Scene). Here we encounter the Little Flower’s favorite theme in relation to the holy Angels, their "holy envy" of mankind, for whom the Son of God was made flesh and died. She owed this in part to her dear, suffering father, to whom she dedicated the Angel Raphael’s words to Tobit: "Because you were acceptable to God, it was necessary that you be tested by various trials." (Tob 12,13; Ecrits divers, Easter Concordance 1894). On this theme she cites one of his letters: "‘Oh! My alleluia is filled with tears. Must you complain very much here below when the Angels up above congratulate you and the Saints envy you. It’s your crown of thorns that makes them jealous. Love, then, its stings as so many proofs of love from the divine Spouse" (LT 120 9/23/1890). A Seraph explains this mystery to St. Valerian: "Spouses loved by heaven, the roses of martyrdom / shall crown your brows,’ says the Angel of the Lord. / "There is no voice, there is no lyre / capable of singing this great favor! / I lose myself in my God, I contemplate His charms, / but I cannot sacrifice myself and suffer for Him. / I can give Him neither my blood nor my tears. / Despite all my love, I cannot die… / The Angel’s purity is his brilliant lot. / His great joy will never end, / But you have the advantage over the Seraphim. / You can be pure, and you can suffer!…" (PN 3, 85-97 St Cecilia). Another Seraph, contemplating the Infant Jesus in the Crib and His love on the Cross, cries out to Emmanuel: "Alas! Why am I an Angel, / incapable of suffering? / Jesus, by a sweet exchange / for You I would like to die!!! ... (The Angels at the Crib of Jesus, Scene 2). Later, Jesus assures the Angel of the Divine Face, that his prayer for mercy will be heard: for consecrated souls, lest they grow tepid: "But these Angels from the earth will be dwelling in a mortal body and sometimes their sublime upward yearnings towards You shall slacken" (ibid., Scene 5); and for sinners, that they become saints: "Grant, o Jesus! that by just one of Your glances You will render them brighter than the stars of the heavens!" Jesus says, "I want to grant your prayer / each and every soul shall obtain pardon / I will fill her with light / as soon as she invokes My name!…" (ibid., Scene 5,9). And then Jesus adds these consoling, luminous words: "O you who upon the earth did will / to share my cross, my pain / Beautiful Angel, hear the mystery / Each soul that suffers is your sister. / In Heaven the radiance of her suffering / upon your face shall shine / and the radiance of your pure essence / will illumine the martyr!…" (ibid., Scene 5, 9-10). That is to say, in heaven the Angels and Saints, in the communion of glory, shall share in and rejoice in one another’s glory. Thus there is a wonderful symbiosis between the Angels and Saints in the economy of salvation. Thérèse expresses this idea to her sister, Céline, explaining why God hadn’t made her an Angel: "If Jesus did not create you an Angel in heaven, it is because He wants you to be an Angel on earth; yes, Jesus wants to have His heavenly court here below just as up above! He wants Angel-martyrs, He wants Angel-apostles, and He has created a little unknown flower, who is named Céline, with this intention in mind. He wills that His little flower save souls for Him; for this, He wills only one thing: that His flower look at Him while suffering her martyrdom… and it is this mysterious glance exchanged between Jesus and His little flower that will effect marvels and will give Jesus a multitude of other flowers." (LT 127 4/26/1891). Later, she assured her that the Angels, "like the vigilant bees know how to gather the honey contained within the mysterious and multiple calyxes that represent souls or rather the children of the virginal little flower…" (LT 132 10/20/1891), that is, the fruits of expiatory love. Her Mission on Earth and in Heaven: As the Little Flower approached her death, she confessed: "I feel that I am about to enter into my rest. But I feel especially that my mission is about to begin, my mission of making God loved as I love Him, of giving my little way to souls. If God answers my desires, my heaven will be spent on earth until the end of the world. Yes, I want to spend my heaven in doing good on earth. This isn’t impossible, since from the bosom of the beatific vision, the Angels watch over us." (CJ 7/17/1897). Thus we see how she understood her heavenly mission in light of the angelic ministries. To Fr. Roulland, her missionary "brother" in China, she writes: "Ah! Brother, I feel it, I shall be more useful to you in heaven than on earth, and it is with joy that I come to announce to you my coming entrance into that blessed city, sure that you will share my joy and will thank the Lord for giving me the means of helping you more effectively in your apostolic works. "I really count on not remaining inactive in heaven. My desire is to work still for the Church and for souls. I am asking God for this and I am certain He will answer me. Are not the Angels continually occupied with us without ever ceasing to see the Divine Face and to lose themselves in the ocean of love without shores? Why would Jesus not allow me to imitate them?" (LT 254 7/14/1897). She assured Fr. Bellière, her first "brother": "I promise to have you taste after my departure for eternal life the happiness one can find in feeling a friendly soul next to oneself. It will not be this correspondence, more or less distant, always very incomplete, which you seem to long for, but it will be a fraternal conversation that will charm the Angels, a conversation that creatures will be unable to reproach since it will be hidden from them." (LT 261 7/26/1897). When Sr. Mary of the Eucharist expressed fright at such visits from Thérèse after her death, the Little Flower replied: "Does your Guardian Angel frighten you? He follows you nevertheless, all the time; well, I will follow you in the same way, and even closer! I won’t let you get away with anything" (Last Conversations, 7/18/1897). Final Synthesis: How clearly the angels formed an integral part of St. Therese's interior life! They were her companions, her brothers, her light, strength, and protection upon her spiritual journey. She could count on them, faithful servants of our Lord Jesus Christ, to whom she had consecrated herself as a child, to whom she had given herself to be their spiritual child in her maturity. She is a guiding light for the members of the Work of the Holy Angels, for unless we become like little children (the essence of the Little Way), we shall never attain any real intimacy with these heavenly spirits. On this path alone shall we be able to fulfill in union with the Angels our mission in the service of Christ and His Church. Your sweet voice is always inviting me to look only at Heaven. The more you see me humble and little, the more your face is radiant. I beg you, fly in my place. Close to those who are dear to me. With your wing dry their tears. Sing how good Jesus is. Sing that suffering has its charms, and softly, whisper my name…. During my short life I want to save my fellow sinners. O Fair Angel of the Homeland, Give me holy fervor. I have nothing but my sacrifices and my austere poverty. With your celestial delights, offer them to the Trinity. For you the Kingdom and the Glory, the Riches of the King of kings. For me the ciborium’s humble Host. For me the cross’ treasure. In peace I await the other life, The joys that will last forever.